Acute extrapyramidal symptoms (EPS) are frequent and serious adverse reactions to antipsychotic (AP) drugs. Although the proposed mechanism is an excessive blockade of dopamine D2 receptors in the striatopallidal pathway of the striatum, previous studies implicated the mTOR pathway in the susceptibility to EPS. The objective of the present study is to analyze the mTOR-mediated response to risperidone in subpopulations of striatal neurons and its relationship to risperidone-induced motor side effects. Two mouse strains (A/J and DBA/2J) with different susceptibility to developing EPS were treated with risperidone 1 mg/kg for three consecutive days. Here we monitored, by double labeling immunohistochemistry, ribosomal protein S6 (rpS6) phosphorylation (Ser235/236 and Ser244/247 sites), a marker of mTOR signaling, in the striatonigral pathway (D1-medium spiny neurons (MSNs)), the striatopallidal pathway (D2-MSNs) and striatal cholinergic interneurons. We found that EPS-resistant DBA/2J mice show higher baseline levels of phosphoactivated rpS6 protein in striatal MSNs, compared with EPS-prone A/J mice. Moreover, risperidone differentially targeted rpS6 phosphorylation in direct and indirect pathway neurons in a strain-specific manner: a significant decrease in the phosphorylation of rpS6 at Ser235/236 and Ser240/244 in DRD1-MSNs EPS-resistant DBA/2J mice after; and a significant increase of phospho-Ser235/236-rpS6 in the striatopallidal pathway of the EPS-prone A/J mice in response to risperidone. Our results reveal the vital role of genetic background in the response to risperidone, and point to the mTOR pathway as an important factor in EPS susceptibility. Acute extrapyramidal symptoms (EPS) are a variety of movement disorder commonly produced by antipsychotic (AP) drugs. Parkinsonism, akathisia, dyskinesia and acute dystonia are examples of this adverse effect, which can impair quality of life, stigmatize patients and lead to poor antipsychotic adherence and relapse . Little is known about the exact mechanism underlying EPS, but the striatum is known to play a critical role in the motor side effects associated with AP . The striatum, as part of the extrapyramidal system, is a key component of motor control. The main cellular component of the striatum are GABAergic medium spiny neurons (MSNs), which are subdivided into two large populations according to whether they are enriched in dopamine D1 or D2 receptors (DRD1s and DRD2s) . The direct striatonigral pathway is assumed by DRD1 expressing MSNs and stimulates thalamocortical circuits, inducing an increase in motor activity. Coordinated, DRD2-enriched MSNs drive the indirect striatopallidal pathway, which down-regulates the control of motor function through the inhibition of thalamo-cortical inputs . Excessive striatal DRD2 blockade is believed to be the principal cause of EPS; however, the molecular mechanism and the downstream effectors involved are largely unknown. Recent investigations of dopamine receptor signaling have shown that dopamine receptors, apart from their canonical action on cAMP-mediated signaling , can regulate cellular responses through non-G protein mechanisms such as ion channels , receptor tyrosine kinases  or proteins such as β-arrestins . Previous work from our lab, using genome-wide gene expression analysis, revealed a connection between the development of EPS and the mTOR pathway in mice striatum and in peripheral blood of naïve patients suffering a first episode of psychosis [9-11]. Recently, various authors have implicated the mTOR signaling pathway in the modulation exerted by AP drugs such as thioridazine [12,13], olanzapine , haloperidol [15,16] and risperidone , among others. In parallel, several studies provide evidence for the involvement of disrupted mTOR signaling in the neuropathology of schizophrenia . Downregulation of reelin expression , glutamatergic dysfunction  or alterations in TrkB activation  are some of the phenotypes which seem to be implicated in the mTOR signaling dysfunction related to schizophrenia. The relationship between mTOR and motor alterations has also been observed in Parkinson disease. Prolonged administration of L-dopa produces serious motor alterations such as dyskinesia, which appear to be caused by the development of strong sensitization at the level of DRD1 signaling and the mTOR pathway [22,23]. We hypothesized that under a strong antagonism of DRD2 (as expected in patients treated with risperidone), which would affect the indirect striatopallidal pathway, the control of the thalamus would depend on DRD1 in the direct striatonigral pathway. Genetic variations in downstream effectors of DRD1, such as mTOR, could thus lead to an incomplete control of motor activity, and therefore to an increased risk of AP-induced EPS. In the present study, we analyze the mTORmediated response to risperidone administration in populations of striatal neurons from two mice strains. These strains were selected from previous studies according to their EPS profile, one with susceptibility to developing EPS (A/J) and another with resistance (DBA/2J) [9,24]. To this end, we studied the phosphorylation pattern of ribosomal protein S6 (rpS6), which is phosphorylated at Ser235/236 and Ser244/247 residues by rps6 kinase, a major downstream effector of mTOR . The results presented here provide new evidence of mTOR pathway involvement in the susceptibility to risperidoneinduced motor side effects. Male mice (7–8 weeks old) from two inbred strains, A/JOlaHsd (A/J) and DBA/2JRccHsd (DBA/2J) (Harlan Laboratories, Sant Feliu de Codines, Spain), were housed five per cage under a 12 h dark/light cycle with free access to food and water. Mice were allowed to acclimatize to the colony for 1–2 weeks before the initiation of treatments. All animal-related procedures were performed in accordance with European Union guidelines for the care and use of laboratory animals and were approved by the local animal care committee of the University of Barcelona and the Generalitat de Catalunya. Mice were injected i.p. at 10 ml/kg with risperidone (1 mg/kg, see ) or saline once per day for three consecutive days. Injections were performed at 9:00–9:30 hours. Risperidone (Sigma-Aldrich, St Louis, MO, USA) was suspended in saline. For each strain two groups with risperidone or vehicle conditions were created. A total of 24 male mice were used in the study (6 animals per group). The dose and time of administration are based on our previous work, where different doses of risperidone were tested using the same strains . The dose selected for this study was the minimum dose used at which significant differences were observed in motor activity between the two strains . Mice were sacrificed 1 hour after the last risperidone administration. Animals were deeply anesthetized with pentobarbital and transcardially perfused with saline, followed by 4% paraformaldehyde. After being removed and postfixed in 4% paraformaldehyde overnight at 4 °C and transferred into 30% sucrose, their brains were frozen in dry ice and sliced coronally in a cryostat (30-μm). Sections were collected serially and stored at -20 ºC in a solution containing 25% (v/v) ethylene glycol, 25% (v/v) glycerol and 50% (v/v) sodium phosphate buffer, until processing for histological procedures. A series of every six sections of the striatum was used. Free-floating striatal sections were preincubated in PBTBSA (PB 1X containing 0.5% Triton X-100 and 0.1% BSA) for 5 min before performing immunohistochemistry, as previously described . The primary antibodies used were a guinea pig anti-proDynorphin (ppDyn, 1:500; Neuromics, Minneapolis, MN, USA) to label D1-type MSNs , a mouse anti- Enkephalin (Enk, 1:100; Abcam, Cambridge, UK) to label D2-type MSNs , a goat anti- ChAT to label cholinergic interneurons (1:100; Millipore, Billerica, MA, USA; ), a rabbit anti-phospho-Ser240/244-rpS6 (1:1000, Cell Signaling Technology, Beverly, MA, USA) and a rabbit anti-phospho-Ser235/236-rpS6 (1:200, Cell Signaling Technology). Primary antibodies were detected by using Alexa Fluor-594 and Alexa Fluor-488 conjugated secondary antibodies (1:1.000; Life Technologies, Eugene, OR, USA). For double-immunostaining, sections were incubated simultaneously with either primary or secondary antibodies. Additionally, total cellular nuclei in the striatum were stained with 496-diamidino-2-phenylindole (DAPI; 1:1000; Calbiochem, Billerica, MA, USA) for 12 min in 0.1 N phosphate buffer. Sections were mounted on SuperFrost Plus slides (ThermoFisher Scientific, Waltham, MA, USA) and coverslipped with Fluoro Gel (Electron Microscopy Sciences, Hatfield, PA, USA). Slices were photographed using a Leica SP5 confocal microscope with a 20X objective. DAPI was used to define the anatomical structures which were identified according to the atlas of Paxinos and Watson . Quantitative estimates of the number of immunoreactive cells were determined using the optical fractionator method, as described previously . Briefly, this is an unbiased, stereological cell counting method that is not affected by the volume of reference or size of the counted elements. For each animal, a minimum of four dorsal striatum sections were imaged. The counting of positive cells in this brain structure was performed with a systematic random design of dissector counting frames (200 x 200 μm). Four independent fields were selected randomly along the dorsal striatum and the number of marked cells was counted manually within each frame and averaged to calculate the density for each animal. Double-positive cells were identified as yellow in the merged images. DAPIstained cells in the dissectors were determined using the thresholding method. Finally, the number of positive cells among all DAPI-stained cell densities was calculated to normalize the values. Image analysis was performed with the aid of NIH ImageJ software (National Institutes of Health, MD, USA). Data were analyzed using a two-way (‘Genotype’ x ‘Treatment’) ANOVA. The means of each experimental group were compared posthoc by Student’s t-test if two groups were compared or by Bonferroni tests if more than two groups were compared. All analyses were performed using SPSS (version 22.0, Chicago, IL, USA) for Windows. Data are presented as the mean plus SEM. Phosphorylation of rpS6 is commonly used as a readout for mTOR activation . Two major phospho-serine residues have been described for rpS6: Ser235/236 and Ser240/244 (both associated with upstream rpS6 kinase activation). We therefore evaluated the pattern of phospho-rpS6 at both residues in dorsal striatal cells of DBA/2J and A/J mice after risperidone treatment. In control (i.e. vehicleinjected) mice, phosphorylation at both Ser240/244 and Ser235/236 was significantly higher in DBA/2J mice than in A/J mice (% immunopositive cells/DAPI: phospho- Ser240/244-rpS6 MANOVA ‘Genotype’: F(1, 24)=25.74, p<0.001; phospho-Ser235/236- rpS6 MANOVA ‘Genotype’: F(1, 24)=19.97, p<0.001; (Figure 1)). Additionally, risperidone treatment (three daily injections) decreased the fraction of cells immunoreactive for phospho- Ser240/244 and phospho-Ser235/236 in EPSresistant DBA/2J mice (% immunopositive cells/ DAPI: phospho-Ser240/244-rpS6 MANOVA ‘Genotype’ x ‘Treatment’: F(1, 24)=13.16, p=0.002; phospho-Ser235/236-rpS6 MANOVA ‘Genotype’ x ‘Treatment’: F(1, 24)=11.88, p=0.003), but it had no effect in EPS-prone A/J mice compared with corresponding controls (% immunopositive cells/DAPI: phospho- Ser240/244-rpS6 MANOVA ‘Treatment’: F(1, 24)=2.30, p=0.148; phospho-Ser235/236- rpS6 MANOVA ‘Treatment’: F(1, 24)=3.38, p=0.081; (Figure 1)). Figure 1: Risperidone decreased rpS6 phosphorylation at Ser240/244 and Ser235/236 in the striatum of the mice strain with resistance to developing EPS. MSNs constitute the major striatal population, giving rise to direct (D1DR) and indirect (D2DR) output pathways. To examine how mTOR signaling changes specifically in direct pathway neurons, we co-labeled tissue sections from both mouse strains for rpS6 and ppDynorphin (ppDyn), a well-established marker of D1DR MSNs. In keeping with data above, both phospho-Ser235/236 and phospho- Ser240/244 were significantly increased in ppDyn+ cells of control DAB/2J mice compared with A/J mice (% immunopositive cells/ DAPI: phospho-Ser240/244-rpS6 MANOVA ‘Genotype’: F(1, 24)=9.62, p=0.007; phospho- Ser235/236-rpS6 MANOVA ‘Genotype’: F(1, 24)=5.69, p=0.027; (Figure 2)). Moreover, risperidone treatment selectively decreased phospho-rpS6 in ppDyn+ cells of DBA/2J mice (% immunopositive cells/DAPI: phospho-Ser240/244-rpS6 MANOVA ‘Genotype’ x ‘Treatment’: F(1, 24)=1.63, p=0.220; Figure 2C and 2D; phospho-Ser235/236-rpS6 MANOVA ‘Genotype’ x ‘Treatment’: F(1, 24)=7.11, p=0.015; (Figure 2A and 2B)). In A/J mice (susceptible to developing EPS) this AP drug did not induce any significant effect on these rpS6 phosphorylations in this GABAergic population (% immunopositive cells/DAPI: phospho- Ser240/244-rpS6 MANOVA ‘Treatment’: F(1, 24)=0.90, p=0.356; phospho-Ser235/236- rpS6 MANOVA ‘Treatment’: F(1, 24)=4.23, p=0.053; (Figure 2)). (D). Quantifications were normalized by all DAPI-stained cells. *:p<0.05 A/J Vehicle vs. DBA/2J Vehicle; #: p<0.05 DBA/2J Vehicle vs. DBA/2J Risperidone (n = 24 in B and D). Bonferroni tests after significant two-way ANOVAs. It is widely accepted that binding of risperidone to DRD2s antagonizes the indirect pathway [26-32]. Thus, we examined whether the DRD2- enriched MSNs, identified with antibodies to enkephalin (Enk+), showed any differences in rpS6 activation between strains, as well as in response to risperidone. As in D1DR+ neurons, baseline levels of p-rpS6 were higher in Enk+ cells of DBA/2J mice compared with A/J mice (% immunopositive cells/ DAPI: phospho-Ser235/236-rpS6 MANOVA ‘Genotype’: F(1, 24)=7.38, p=0.015; (Figures 3A and 3B)). The same occurred with respect to the phosphorylation state of the Ser240/244 residue (MANOVA ‘Genotype’: F(1, 24)=12.69, p=0.002; (Figure 3C and 3D)). By contrast, risperidone administration did not decrease the levels of phospho-Ser240/244-rpS6 in DRD2 MSNs in either strain (% immunopositive cells/ DAPI: phospho-Ser240/244-rpS6 MANOVA ‘Treatment’: F(1, 24)=0.51, p=0.485; MANOVA ‘Genotype’ x ‘Treatment’: F(1, 24)=0.75, p=0.399; (Figure 3C and 3D)). Intriguingly, risperidone increased the number of phospho-Ser235/236- rpS6 immunoreactive DRD2 cells only in A/J mice (% immunopositive cells/DAPI: phospho- Ser235/236-rpS6 MANOVA ‘Genotype’ x ‘Treatment’: F(1, 24)=7.78, p=0.013; MANOVA ‘Treatment’: F(1, 24)=7.69, p=0.013; (Figure 3A and 3B)). (D) Quantifications were normalized by all DAPI-stained cells. *:p<0.05 A/J vs. DBA/2J; **:p<0.01 A/J Vehicle vs. DBA/2J Vehicle; ##: p<0.01 A/J Vehicle vs. A/J Risperidone (n = 24 in B and D). Bonferroni tests after significant two-way ANOVAs. Striatal cholinergic interneurons are critical elements in the control of striatal circuits . To determine whether mTOR signaling in cholinergic interneurons differs between strains with different susceptibility to developing EPS, we evaluated rpS6 phosphorylation in ChAT+ cells. Interestingly, rpS6 phosphorylation at Ser235/236 was lower in cholinergic interneurons of DBA/2J mice compared with those of A/J mice (MANOVA ‘Genotype’: F(1, 24)= 22.41, p<0.001; (Figure 4)). However, risperidone did not change phosphorylation of Ser240/244 or Ser235/236 in ChAT+ cells in either strain (% immunopositive cells/ DAPI: phospho-Ser240/244 MANOVA ‘Genotype’ x ‘Treatment’: F(1, 24)=0.68, p=0.422; MANOVA ‘Treatment’: F(1, 24)=0.00, p=0.998; phospho-Ser235/236-rpS6 MANOVA ‘Genotype’ x ‘Treatment’: F(1, 24)=0.41, p=0.842; MANOVA ‘Treatment’: F(1, 24)=0.75, p=0.397; (Figure 4)). (D) Quantifications were normalized by all DAPI-stained cells. ***:p<0.001 A/J vs. DBA/2J (n = 24 in B and D). Bonferroni tests after significant two-way ANOVAs. The aim of the present study was to elucidate the effects of risperidone on mTOR signaling in either the indirect striatopallidal or the direct striatonigral pathway, in relation to AP-induced EPS susceptibility. To address this issue, we analyzed the different populations of striatal neurons and evaluated their mTOR-mediated response to risperidone in two mice strains with well-known different susceptibility to developing EPS [9,24]. Signaling patterns differ in DRD1 and DRD2 neurons, in other words, there is complete mechanistic segregation between the striatonigral and striatopallidal circuits within the striatum in response to pharmacological stimuli [34,35]. In fact, dopamine receptors encoded in the Drd1a and Drd2 genes have been identified for association with haloperidol-induced tardive dyskinesia in mice [24,36]. Risperidone, as a DRD2s blocker, promotes a antagonism of the indirect striatopallidal pathway . In this situation, the motor control of the striatum will depend mainly on DRD1 in the direct striatonigral pathway. Differences between susceptible and resistant mice in the sensitization of DRD1 signaling in the direct pathway could explain why EPS are produced in response to risperidone stimulation. Here, our results for the A/J mice strain (susceptible to EPS) showed that the treatment had no effect on the phosphorylation of rpS6 at Ser235/236 and Ser240/244 in the direct striatonigral pathway. By contrast, the DBA/2J mice strain (resistant to EPS) showed, when treated with risperidone, a significant decrease in the phosphorylation of rpS6 at Ser235/236 and Ser240/244. The different genetic backgrounds of the strains may confer differences related to mTOR regulation in DRD1 MSNs, which could explain the deficient motor control regulation in susceptible mice. In this regard, the phosphorylation levels of rpS6 in the susceptible strain are below those shown by the resistant strain. These results indicate that differences in mTOR-mediated signaling in the DRD1 MSNs population could be a mechanism in the development of EPS. Additionally, future studies should explain in which way administration of risperidone reduces the phosphorylation of rpS6 in direct MSNs, since these neurons are devoid of D2 receptors. The response to risperidone that we observed in the DRD1 MSNs of DBA/2J resistance mice, mimics the effect of rapamycin in mice models of Parkinson. Since demonstration that DRD1 hypersensitivity induced mTOR activation as a mechanism of action for L-Dopa induced diskynesia, this kinase becomes a viable therapeutic target for dyskinesia . Rapamycin, a potent mTOR inhibitor, has been shown to reduce L-Dopa induced dyskinesia in lesioned mice with 6-hydroxydopamine . Moreover, Rapamycin attenuates dyskinesia through preventing striatonigral neuron activation of mTOR in 6-Hydroxydopaminehemilesioned Rhes knockout mice . A similar effect had been observed in hemiparkinsonian rats treated with another mTOR inhibitor such as Temsirolimus . Future studies will be needed in order to demonstrate if rapamacyn could prevent AP induced EPS in a similar way. A different risperidone-mediated response in DRD2 MSNs was also observed in the striatum of mice either resistant or susceptible to EPS. Whereas DBA/2J mice showed no response to risperidone, high levels of phospho-Ser235/236- rpS6 were found in the striatopallidal pathway of the susceptible strain after drug treatment. In line with these observations, haloperidol has been associated with rpS6 phosphorylation at Ser235/236, specifically at the level of DRD2 MSN cells in the indirect striatopallidal pathway . Recently, Dadalko et al. demonstrated the involvement of mTORC2 signaling in the regulation of the striatal dopamine (DA) tone and D2R signaling. Additionally, they showed that the changes in striatal DA neurotransmission and associated behaviors are caused by elevated DRD2 expression. We hypothesize that the response in D2DR striatal neurons at Ser235/236 in susceptible mice could be a compensatory mechanism to reduce the motor side effects of antipsychotic drugs, which may be due to DRD2 expression in MSNs, since DRD1 signaling is deficient in these animals. However, additional studies are needed to explore the basis of this phenotype. 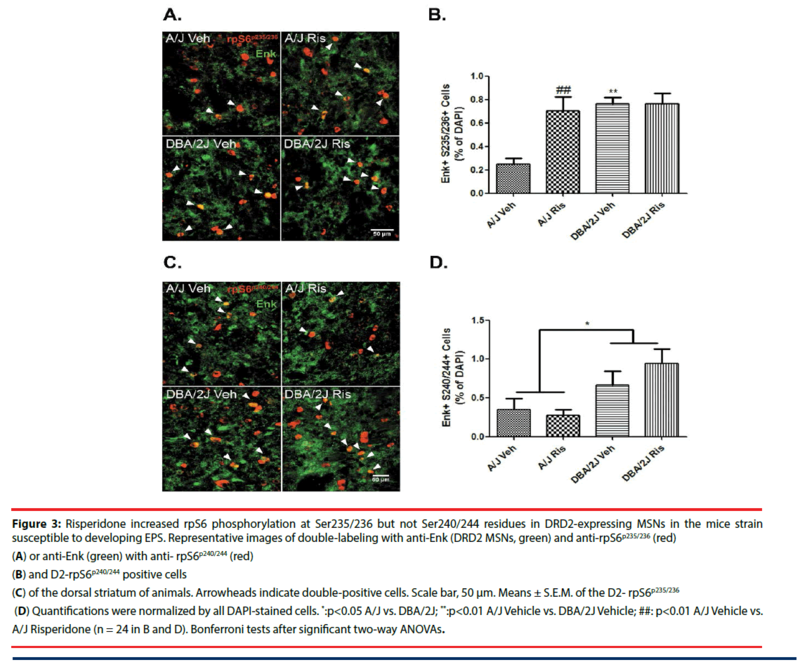 In response to treatment with risperidone, A/J and DBA/2J strains presented different total levels of immunoreactive cells at Ser240/244 and Ser235/236 in the dorsal striatum, specifically, a response was only observed in resistant mice. Despite the dissimilar response of the DRD1 and DRD2 neuron populations in the two strains, differences in total levels of phosphorylation do not appear to be due exclusively to the GABAergic MSN reaction. Dopamine release by dopaminergic neurons regulates acetylcholine release through DRD2 and DRD5 that are located directly on striatal cholinergic interneurons. As feedback, cholinergic interneurons stimulate MSNs activity [41-44]. The observed differences may be insufficient to explain a complex phenotype such as EPS. We have to bear in mind that, although the main mechanism proposed to explain the phenotype of AP-induced EPS is excessive blockade of D2 receptors in the striatum, the complexity of this phenotype does not seem to be explained by the simple interaction between APs and DRD2. These phenotypes cannot be explained by the response of a single regulatory pathway with a major effect. It is rather due to the presence of multiple pathways and proteins with discrete effects that interact between them. Our study supports the hypothesis that AP treatment, through its action on dopamine receptors, may modulate the mTOR signaling pathway and differences in the regulation of this pathway may be involved in the susceptibility to develop APinduced EPS. Recent works have begun to explore the involvement of cholinergic interneurons and their mTOR-mediated mechanism in motor alterations [45,46]. Specifically, previous reports have shown that haloperidol administration induces the phosphorylation of rpS6 at the Ser235/236 residue in cholinergic interneurons . Here, we were unable to observe any effect of risperidone on rpS6 phosphorylation in the striatal cholinergic interneurons of the mouse model of EPS. The differences in rpS6 responsiveness among studies could be due to differences in the AP drug used and to doses and modes of administration of haloperidol. Kharkwal et al. performed immunofluorescence analyses of rpS6 phosphorylation after just a single dose of haloperidol (1 mg/kg), whereas in the present study we treated the animals with risperidone once per day for as many as three consecutive days. In addition, the understanding of the different mechanisms underlying the effects of typical (haloperidol) and atypical (risperidone) AP drugs remains limited and unclear . However, basal differences, prior to treatment, between the two strains are independent of the drug and could explain the different susceptibility to EPS. This susceptibility could be common to different AP drugs, since the two strains have been phenotyped in response to haloperidol  and risperidone . As already mentioned, it is known that DRD2s are occupied by risperidone, blocking the indirect pathway. However, this antipsychotic drug is also characterized by a very high affinity for 5-HT2A receptors. A recent study implicated mTOR, as a signaling complex physically associated with the 5-HT6 receptor, in the mechanism of perturbed cognition in schizophrenia . In addition, there are several evidences suggesting that potent 5-HT2a receptor blockade is related to the low EPS profile of other antipsychotics like clozapine . Future studies should test the 5-HTmediated response pattern in the striatum of mouse models of EPS and its link to the mTOR pathway. The main limitation of the present study is that, although we have established an association between the cell-specific modulatory effects that risperidone exerts on rps6 phosphorylation in the striatum and the susceptibility to AP-induced EPS, we could not evaluate a direct correlation between mTOR activity and motor alterations. The two strains selected for the present study have been previously phenotyped for EPS, using standard procedures that include rotarod, openfield and catalepsy test, in response to both, typical AP (i.e. haloperidol ) and atypical AP (risperidone ). However, EPS were not evaluated in the animals used in the present study. For this reason, we cannot perform the correlation between risperidone induced EPS and mTOR activity in the striatum. Moreover, we assessed the phosphorylation of rpS6 as an indirect marker of mTOR activation . Although this is a common and widespread practice, this approach is subject to some limitations; mainly that rps6 phosphorylation may depend on other kinases, such as PKA or p90S6K. Finally, only the inhibition of mTOR in our model would confirm our findings. Unfortunately, limitations in the availability of animals have prevented us from realizing this confirmation. Despite this limitation, the results presented here support the involvement of mTOR signaling in the susceptibility to develop EPS in response to AP treatment. Overall, our findings demonstrate that EPS susceptibility is related to a deficient response of the DRD1-mTOR pathway. Mice susceptible to developing EPS under treatment with risperidone showed: (1) lower baseline levels of rps6 phosphorylation in the striatum; (2) no rps6 phosphorylation response after risperidone treatment in the direct striatonigral pathway; and (3) increased rps6 phosphorylation in the indirect striatopallidal pathway in response to risperidone. Our results imply the involvement of the mTOR pathway in the susceptibility to risperidoneinduced EPS. Previously, we hypothesized that under a strong AP-induced antagonism of DRD2 in the striatopallidal pathway, the motor control performed by the striatum would depend on DRD1. Thus, the present study provides further support for the important role of DRD1 in the regulation of motor side effects. Specifically, we describe that inhibition of mTOR signaling in the striatonigral MSNs is a possible mechanism underlying the resistance to EPS. Additionally, we found a different mTOR-mediated response in DRD2 MSNs among strains with different susceptibility to developing EPS. Future research should aim to provide further molecular insights into these phenotypes. Our results reveal the vital role of the genetic background of individuals and point towards the mTOR pathway as an important agent of EPS susceptibility in response to risperidone. Further analysis of the mTORmediated response to AP drugs in the mouse model of EPS will provide new insights into the mechanism of genetic background in relation to EPS susceptibility. The authors wish to express their gratitude to Juan Sánchez for technical assistance and to the Language Advisory Service of the University of Barcelona, Spain for manuscript revision. This study was supported by the Spanish Ministry of Health, Instituto de Salud Carlos III (FIS, Fondo de Investigacion Sanitaria PI10/02430, PI13/00812, PI16/0122), the Catalan Innovation, Universities and Enterprise Authority (Grants DURSI 2014SGR436 and 2014SGR441) and Almirall Awards (Best Pharmacology Project of 2015, Spanish Society of Pharmacology). DB is supported by a FPU fellowship (FPU14/06834) from the “Ministerio de Educación, Cultura y Deporte”. The authors declare no conflict of interest. Haddad PM, Das A, Keyhani S, et al. Antipsychotic drugs and extrapyramidal side effects in first episode psychosis: a systematic review of head-head comparisons. J. Psychopharmacol 26(1), 15- 26 (2012). Creese I, Burt DR, Snyder SH. Dopamine receptor binding predicts clinical and pharmacological potencies of antischizophrenic drugs. J. Neuropsychiatry. Clin. Neurosci 8(1), 223-226 (1996). Gerfen CR. The Neostriatal Mosaic: Multiple Levels of Compartmental Organization in the Basal Ganglia. Annu. Rev. Neurosci 15(1), 285-320 (1992). Gerfen CR, Engber TM, Mahan LC, et al. D1 and D2 dopamine receptor-regulated gene expression of striatonigral and striatopallidal neurons. Science 250(1), 1429-1432 (1990). Beaulieu JM, Espinoza S, Gainetdinov RR. Dopamine receptors - IUPHAR Review 13. Br. J. Pharmacol 172(1), 1-23 (2015). Li S, Wong AH, Liu F. Ligand-gated ion channel interacting proteins and their role in neuroprotection. Front. Cell. Neurosci 8(1), 125 (2014). Mannoury la Cour C, Salles MJ, Pasteau V, et al. Signaling pathways leading to phosphorylation of Akt and GSK-3beta by activation of cloned human and rat cerebral D(2)and D(3) receptors. Mol. Pharmacol 79(1), 91-105 (2011). Beaulieu JM, Marion S, Rodriguiz R, et al. A beta-arrestin 2 signaling complex mediates lithium action on behavior. Cell 132(1),125- 136 (2008). Mas S, Gassó P, Boloc D, et al. Network analysis of gene expression in mice provides new evidence of involvement of the mTOR pathway in antipsychoticinduced extrapyramidal symptoms. Pharmacogenomics. J 16(1),293-300 (2016). Mas S, Gassó P, Parellada E, et al. Network analysis of gene expression in peripheral blood identifies mTOR and NF-κB pathways involved in antipsychoticinduced extrapyramidal symptoms. Pharmacogenomics. J 15(1), 452-460 (2015). Mas S, Gassó P, Ritter MA, et al. Pharmacogenetic predictor of extrapyramidal symptoms induced by antipsychotics: Multilocus interaction in the mTOR pathway. Eur. Neuropsychopharmacol 25(1),51-59 (2015). Pham X, Song G, Lao S, et al. The DPYSL2 gene connects mTOR and schizophrenia. Transl. Psychiatry 6(1), e933 (2016). Shin SY, Lee KS, Choi YK, et al. The antipsychotic agent chlorpromazine induces autophagic cell death by inhibiting the Akt/mTOR pathway in human U-87MG glioma cells. Carcinogenesis 34(1), 2080- 2089 (2013). Schmidt RH, Jokinen JD, Massey VL, et al. Olanzapine Activates Hepatic Mammalian Target of Rapamycin: New Mechanistic Insight into Metabolic Dysregulation with Atypical Antipsychotic Drugs. J. Pharmacol. Exp. Ther 347(1),126-135 (2013). Bonito-Oliva A, Pallottino S, Bertran- Gonzalez J, et al. Haloperidol promotes mTORC1-dependent phosphorylation of ribosomal protein S6 via dopamine- and cAMP-regulated phosphoprotein of 32 kDa and inhibition of protein phosphatase-1. Neuropharmacology 72(1), 197-203 (2013). Dadalko OI, Siuta M, Poe A, et al. mTORC2/ Rictor Signaling Disrupts Dopamine- Dependent Behaviors via Defects in Striatal Dopamine Neurotransmission. J. Neurosci 35(1), 8843-8854 (2015). Korostynski M, Piechota M, Dzbek J, et al. Novel drug-regulated transcriptional networks in brain reveal pharmacological properties of psychotropic drugs. BMC. Genomics 14(1), 606 (2013). Gururajan A, van den Buuse M. Is the mTOR-signalling cascade disrupted in Schizophrenia? J. Neurochem 129(1), 377- 387 (2014). Tamura Y, Kunugi H, Ohashi J, et al. Epigenetic aberration of the human REELIN gene in psychiatric disorders. Mol. Psychiatry 12(1), 593-600 (2007). Gong R, Park CS, Abbassi NR, et al. Roles of glutamate receptors and the mammalian target of rapamycin (mTOR) signaling pathway in activity-dependent dendritic protein synthesis in hippocampal neurons. J. Biol. Chem 281(1), 18802-18815 (2006). Huang SH, Wang J, Sui WH, et al. BDNFDependent Recycling Facilitates TrkB Translocation to Postsynaptic Density during LTP via a Rab11-Dependent Pathway. J. Neurosci 33(1), 9214-9230 (2013). Santini E, Feyder M, Gangarossa G, et al. Dopamine- and cAMP-regulated Phosphoprotein of 32-kDa (DARPP-32)- dependent Activation of Extracellular Signalregulated Kinase (ERK) and Mammalian Target of Rapamycin Complex 1 (mTORC1) Signaling in Experimental Parkinsonism. J. Biol. Chem 287(1), 27806-27812 (2012). Santini E, Valjent E, Fisone G. mTORC1 signaling in Parkinson’s disease and L-DOPAinduced dyskinesia: A sensitized matter. Cell. Cycle 9(1), 2713-2718 (2010). Crowley JJ, Adkins DE, Pratt AL, et al. Antipsychotic-induced vacuous chewing movements and extrapyramidal side effects are highly heritable in mice. Pharmacogenomics. J 12(1), 147-155 (2012). Knight ZA, Tan K, Birsoy K, et al. Molecular profiling of activated neurons by phosphorylated ribosome capture. Cell 151(1), 1126-1137 (2012). García-Cerro S, Martínez P, Vidal V, et al. Overexpression of Dyrk1A is implicated in several cognitive, electrophysiological and neuromorphological alterations found in a mouse model of down syndrome. PLoS. One 9(1), e106572 (2014). Hubert GW, Kuhar MJ. Colocalization of CART peptide with prodynorphin and dopamine D1 receptors in the rat nucleus accumbens. Neuropeptides 40(1), 409-415 (2006). Gerfen CR, Keefe KA, Gauda EB. D1 and D2 dopamine receptor function in the striatum: coactivation of D1- and D2-dopamine receptors on separate populations of neurons results in potentiated immediate early gene response in D1-containing neurons. J. Neurosci 15(1), 8167-8176 (1995). García-Cerro S, Rueda N, Vidal V, et al. Normalizing the gene dosage of Dyrk1A in a mouse model of Down syndrome rescues several Alzheimer’s disease phenotypes. Neurobiol. Dis 106(1), 76-88 (2017). Paxinos G, Watson C. The Rat Brain in Stereotaxic Coordinates, 6th Ed. Academic Press, NY (2007). Hunter CL, Bachman D, Granholm AC. Minocycline prevents cholinergic loss in a mouse model of Down’s syndrome. Ann. Neurol 56(1), 675-688 (2004). Remington G, Kapur S. Atypical antipsychotics: are some more atypical than others? Psychopharmacology (Berl) 148(1), 3-15 (2000). Lim SAO, Kang UJ, McGehee DS. Striatal cholinergic interneuron regulation and circuit effects. Front. Synaptic Neurosci 6(1), 22 (2014). Bertran-Gonzalez J, Bosch C, Maroteaux M, et al. Opposing Patterns of Signaling Activation in Dopamine D1 and D2 Receptor-Expressing Striatal Neurons in Response to Cocaine and Haloperidol. J. Neurosci 28(1), 5671-5685 (2008). Lindgren HS, Ohlin KE, Cenci MA. Differential Involvement of D1 and D2 Dopamine Receptors in L-DOPA-Induced Angiogenic Activity in a Rat Model of Parkinson’s Disease. Neuropsychopharmacol 34(1), 2477-2488 (2009). Crowley JJ, Kim Y, Szatkiewicz JP, et al. Genome-wide association mapping of loci for antipsychotic-induced extrapyramidal symptoms in mice. Mamm. Genome 23(1), 322-335 (2012). Santini E, Heiman M, Greengard P, et al. Inhibition of mTOR signaling in Parkinson’s disease prevents L-DOPA-induced dyskinesia. Sci. Signal 2, ra36 (2009). Brugnoli A, Napolitano F, Usiello A, et al. 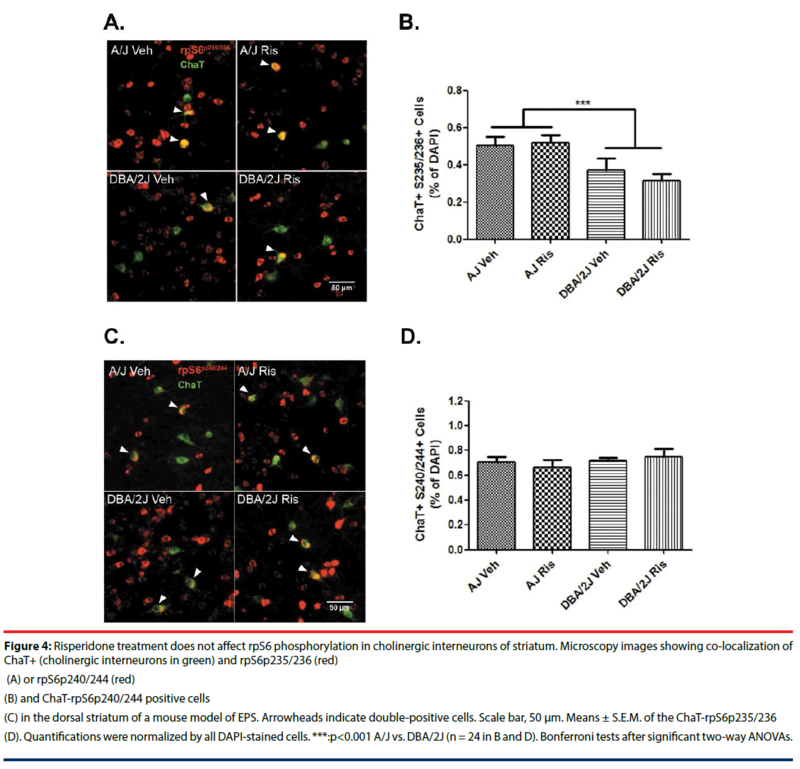 Genetic deletion of Rhes or pharmacological blockade of mTORC1 prevent striato-nigral neurons activation in levodopa-induced dyskinesia. Neurobiol. Dis 85(1), 155-163 (2016). Decressac M, Björklund A. mTOR inhibition alleviates L-DOPA-induced dyskinesia in parkinsonian rats. J. Parkinsons. Dis 3(1), 13-17 (2013). Valjent E, Bertran-Gonzalez J, Bowling H, et al. Haloperidol Regulates the State of Phosphorylation of Ribosomal Protein S6 via Activation of PKA and Phosphorylation of DARPP-32. Neuropsychopharmacology 36(1), 2561-2570 (2011). Alcantara AA, Chen V, Herring BE, et al, 2003. Localization of dopamine D2 receptors on cholinergic interneurons of the dorsal striatum and nucleus accumbens of the rat. Brain. Res 986(1), 22-29. Cachope R, Mateo Y, Mathur BN, et al. Selective activation of cholinergic interneurons enhances accumbal phasic dopamine release: setting the tone for reward processing. Cell. Rep 2(1), 33-41 (2012). Nelson AB, Hammack N, Yang CF, et al. Striatal Cholinergic Interneurons Drive GABA Release from Dopamine Terminals. Neuron 82(1), 63- 70 (2014). Threlfell S, Lalic T, Platt NJ, et al. Striatal Dopamine Release Is Triggered by Synchronized Activity in Cholinergic Interneurons. Neuron 75(1), 58-64 (2012). Bertran-Gonzalez J, Chieng BC, Laurent V, et al. Striatal Cholinergic Interneurons Display Activity-Related Phosphorylation of Ribosomal Protein S6. PLoS. One 7(1), e53195 (2012). Kharkwal G, Brami-Cherrier K, Lizardi-Ortiz JE, et al. Parkinsonism Driven by Antipsychotics Originates from Dopaminergic Control of Striatal Cholinergic Interneurons. Neuron 91(1), 67-78 (2016). Miller DD, Andreasen NC, O’Leary DS, et al. Comparison of the effects of risperidone and haloperidol on regional cerebral blood flow in schizophrenia. Biol. Psychiatry 49(1), 704-715 (2001). Meffre J, Chaumont-Dubel S, Mannoury la Cour C, et al. 5-HT(6) receptor recruitment of mTOR as a mechanism for perturbed cognition in schizophrenia. EMBO Mol. Med 4(10), 1043-1056 (2012). Meltzer HY. The role of serotonin in antipsychotic drug action. Neuropsychopharmacol 21(2 Suppl), 106S-115S (1999).